Traditional power/progressive metal may not possess the same reverence in North America that it does overseas, but thanks to the internet and the decade plus run of the Progpower festival, consumers gain amply opportunity for exposure to newcomers and veterans alike. Pennsylvania’s MindMaze are a quartet of musicians in their mid-20’s that possess incredible knowledge and insight into these genres, delivering a second studio album in Back from the Edge that should aid their ascent to another level due to professional execution and stunning dynamic craftsmanship. Guitarist/keyboardist Jeff Teets layers many of these tracks in such a way that even while being slightly adventurous and intricate, he never forgets about placing the harmonic passages or smart hook that will get heads bobbing, hands clapping, or exult cheers when performing for live audiences. Some of his best work occurs on the Tad Morose meets Savatage oriented “Through the Open Door” as well as the shape shifting “Consequence of Choice” that manages to incorporate restrained, clean acoustic strumming at times with emotionally moving power chords reminiscent of the early Evergrey discography. 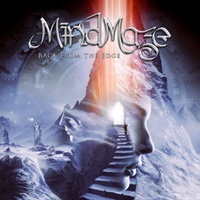 Gaining Symphony X bassist Mike LePond’s presence impacts MindMaze’s material to the positive: he’s not merely here for name recognition alone, as evidenced by his intelligent, intuitive parts on “Moment of Flight” and the 10 minute progressive arrangement “The Machine Stops”. Jeff’s sister Sarah Teets can be the differentiator to the good in terms of MindMaze’s appeal as a vocalist. She clearly has a set of pipes and remarkable control during the verses, often going up and down the scale in one particular line if need be – but it is not the conventional ‘progressive’ singer you hear from say Ray Alder, older Geoff Tate, or James Labrie. Incorporating more pop and rock tonality through her range and ability to channel things given the mood/texture of each song makes the up-tempo “Dreamwalker” and majestic closer “Onward (Destiny Calls II)” (featuring great off time military marching hits from drummer Kalin Schweizerhof) surefire highlights that many will return to again and again. Couple this with guest spots from Stratovarius’ Jens Johansson, Pharaoh guitarist Matt Johnsen and Lord guitarist Lord Tim (two other acts given the DR approval in the past) plus cover art that is multi-layered and multi-sensory in outlook and it’s very easy to see why there’s a serious buzz going about for MindMaze. Back from the Edge stands tall for the exemplary strength of traditional, progressive power metal – they funnel great aspects of today’s bands and the historical legacy from the 70’s/80’s artists to create songs that stand up eternally.